If you are going to talk about historical and outstanding betting machines, you have to mention the Red Baron poker machine, a creation of the wonderful team of Aristocrat Gaming. Poker machines are often inspired by important or prominent decades throughout the history known to the world; because this Red Baron poker machine is not designed under that, let’s say, principle; it is not specifically inspired by the decade but by the character. For the Red Baron, poker machine is designed and inspired for players to meet Manfred von Richthofen, the famous pilot of the army of German origin, known as the matchless Red Baron that took place in the First World War. There are many fanatical players of the planes and everything related to them. If it happens that as a player you love the pokies with this theme you will enjoy this poker machine as well as others like SkyWay and Flying High. The game Red Baron is available in the different virtual casinos and in demo versions also provided by the NYX group, a company that also produces games that has a modest list of games on its website, such games belonging to the Aristocrat Gaming group. Who was Manfred von Richthofen? Manfred von Richthofen better known as the great Red Baron belonged to the nobility of German origin, who could be known as a free commander or baron. He was called Red Baron because he had a red plane. Manfred von Richthofen remained in service for three years piloting aircraft for the air force of his nation’s army in the memorable First World War. He was considered a hero and highly famous in other armies participating in the war. For not all receive up to thirty honors and get up to eighty victories. This Red Baron poker machine is inspired by this gigantic legend. Aristocrat gaming saw great potential and sought to add the representative vintage style of that era full of wars, airplanes, and armies. This pokie game includes graphics on highlighted elements, such as the old radios, the airships, the plane of the Red Baron and the very protagonist as well. This poker machine does not have pay lines, that is, it does not have the famous Reel Power. Bets instead of taking place in those lines will be made on the different reels. Obviously, if you bet on all five reels and their already included three rows: the options to win more prizes are multiplied, because they will access in that way up to 1024 combinations that will make players win and win. There is a fairly moderate flexibility at the time of betting. These bets can go for two credits, four, ten, and twenty to fifty credits, also from one, two and four Euros. You can bet between fifty credits and one hundred Euros for the use of the five rotating rollers. Thanks to this flexibility in the amount of money to bet, the game is considered ideal for high-ranking players or with a high budget because the fact that the maximum bet is less than five hundred Euros, this makes it extremely attractive. Although there are still some players who come to play again and again without being high-performance players or willing to make big bets. 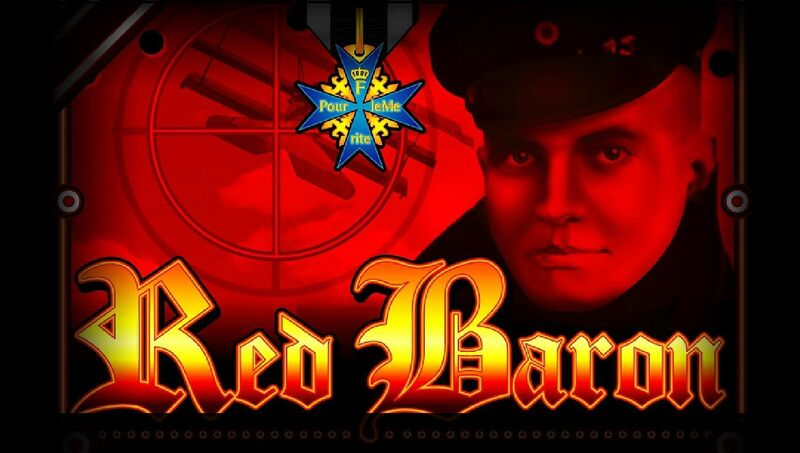 The Red Baron poker machine, the latest game developed by the Aristocrat Gaming team, proves to be quite innovative regardless of the design of the chosen graphics; because one of the best features of this game is that in order to account is to adapt as perfectly as possible to those years where the first world war took place, so we expect a vintage touch that immediately reflects that period of time. This is achieved very well with the graphics also, the Zeppelins are ships that took place in ancient years and radios can still be found in museums that preserve history. However, Aristocratic Gaming is supposed to maintain its modern appearance as a fairly clear screen with high-quality images, so you can guess at first glance that this poker game is a very current one inspired by a very old character. Players like to go to these poker machines because of the power they have to pay the money and get more money. The screen of this machine has a clear sky and a beautiful blue color that is the backdrop or background where all the action will take place, this to replacement of the soundtrack almost non-existent, because it has simple sounds but do not transmit any type of flight or explosions or some other effect that is expected to be linked with this theme. All the graphics are summarized in, a medal, the old radio, the airship, a dog, an unexpected girl, the plane of the Red Baron and the very Red Baron, plus poker cards number 9 and number 10, the letter J, letter Q and letter K, which have less denomination. Strange to be a game of poker, but have seen it comes with graphics so related to the Red Baron. The wildcard is the medal, remembering that the Red Baron became universally known for his thirty honors; this medal takes place in barrel number three, however, and can impressively take the place of the scatter symbol, something that definitely does not happen in other games. This scatters graphic is the black, red and soft target shooting that takes place in barrels number two, number three and number four. The player will obtain fifteen additional spins if he manages to make three graphics of the target shooting fall on the indicated reels. On the screen will be available the different combinations necessary to achieve a victory so that the player is oriented correctly. The pilot’s graph can reward the player with one thousand five hundred credits if five of the same graph falls on the same line. Aristocratic also had the creativity to add a list of different missions that the player should achieve and also obtain gains reflected in multiplier effects; in this way, it gives the feeling that in some way or another is part of this world and the player will feel more comfortable. If the player gets four aircraft graphics then he will get a multiplier effect of up to ten times the number of the bet. Twelve graphics of the red plane will give up to twenty-five times the profit. Likewise, sixteen airplanes have a multiplying effect of sixty times the bet, twenty planes to win one hundred and forty times. The extra benefit of twenty-five aircraft will award a prize of forty times the amount. When starting the round of extra turns you must obtain the indicated number of planes. Each prize obtained with the wildcard medal will generate multiplier effects of two, three and up to five times its value. Certainly, this Red Baron poker machine is simple and without much complication, presents simple graphics and does not have any remarkable visual effect; because it focuses all its appeal on the multiplier effects and aesthetics of its vintage theme. The game also has a ninety-five point seventy percent (95.70%) return to the player.